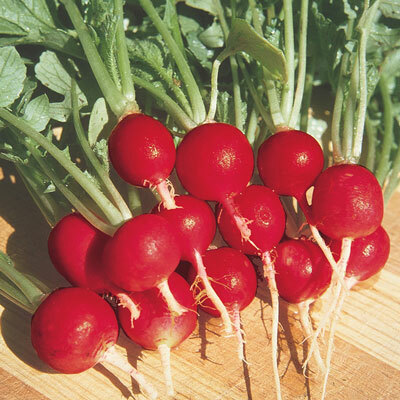 Champion Radish | Henry Field's Seed & Nursery Co. Smooth and round, with bright scarlet skin and crisp, white flesh. Sizes up in a hurry, slow to become pithy. 25 DAYS. Seed Count: Approximately 500 seeds per packet, 1 oz. is approximately 2,400 seeds, and 1/4 lb. is approximately 7,500 seeds. The seed tape is 15 feet long and has approximately 205 seeds. Size: 1/2 - 1 -1.5 inches. Fruit: Scarlet globes with white, mild, firm, crisp flesh.